Are US Troops Qualified to Work on Peace Support or Policy Operations? This was written for last Friday’s Evening Herald (January 13th) but, unluckily, did not make the cut. What is it with some American troops? Why, even in the aftermath of Abu Ghraib and other scandals, do they still seem incapable of acting with restraint and showing even basic common decency? The video, shown on the TV news last night, of a group of US Marines urinating on the bodies of dead Taliban insurgents once again raises the issue of their suitability to serve on peace support operations outside theUSA. It is not as if the guys involved were raw recruits or conscripts: these were Marines: the supposed cream of the American military. Their motto: “Semper Fidelis” means always faithful, presumably that includes fidelity to their own three core values: Honour, Courage Commitment. Clearly the actions of the four Marines who appeared on our screens last night fell well short of that. Indeed that dishonour extends beyond the men filmed to include those who gleefully recorded the sorry episode, probably for future broadcast at private gatherings stateside. None of this can be excused by the stresses and strains of their task or the coarseness of their environment. It is an example of dehumanising of the enemy; of treating those who are fighting against as less than human. This is not an attitude that can be tolerated. It is not in the Afgahnis interest and neither is it in theUS’s either. While the Americans serve inAfghanistanas part of a UN mandated NATO coordinated mission, their presence has a greater and wider significance. Those who support the mission in Afghanistan (and I include myself in that) can point to a number of positives it has already helped achieve: new motorways and buildings; 4 million children now attending school, including many for the first time; a growing economy, a new constitution, and the return of more than 2.5 million refugees. The action of the Marines not only undermines these achievements, it seriously dents the already precarious support of the Afghan people for the mission’s continuing presence. Their despicable actions potentially put their comrades at greater risk. This sorry dehumanising episode again raises serious questions about the institutional ability of American troops to serve on peace support or quasi policing operations in regions or communities with different cultures and traditions. It is not something new. I recall a mid rankingUKofficer recounting his experience with American officers under his command on a multi-lateral mission in sub Saharan Africa. He told me that he had a tough time even getting them to take off their mirrored sunglasses when talking with locals. He told me of his frustration in having to constantly tell the Americans that this was vital to build up trust with the locals. The local culture demanded that you be able to look into someone’s eyes when they spoke with you. You have to treat those you are there to protect as your equal, not as your inferior – and not as your enemy. It is something that now comes instinctively to our troops serving overseas. Perhaps this is in part due to our sense memory of being a former colony. We can empathise with the plight of the local communities and the hardship they endure while retaining our impartiality and commitment to our mission. It is something that can be taught. Significantly it is taught here at the UN Training School in the Curragh Camp. 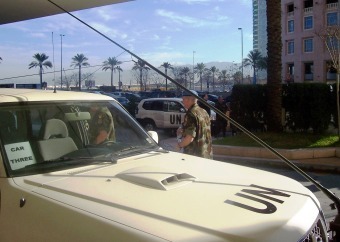 The UN School runs United Nations Military Observers and Staff Officers courses. While the offending Marines will probably be drummed out of the army, perhaps their senior commanding officers might be sent to the Curragh for some basic lessons in how to get their people to start showing respect.